This ornament idea is very inexpensive and can be made with the help of your children, who will think it's pretty cool to find ornament materials in your yard. 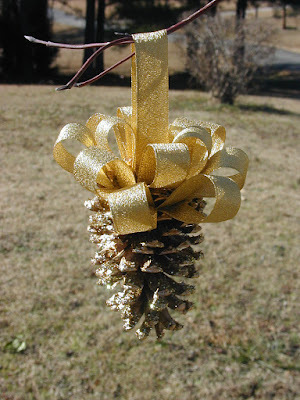 It also seems pretty natural to use an element that is found in the type of trees (conifer) we use for Christmas. Immediately after painting, sprinkle glitter onto cone so that it will stick to the wet paint. Once paint is dry, attach ribbon to top of cone. To attach ribbon, cut a large piece to make the hanger loop and glue that loop to the center. Cut smaller ribbon strips to form loops around hanger loop (I used 5 small pieces). Cut a few more longer ribbon strips (I used 8) looped to attach around the bottom of the other row of ribbon loops. * You can also skip the ribbon step and just put several of these glittery ornaments in a pretty bowl or hurricane vase to decorate your home, or leave them on your tree outside where you let them dry. Copyright © 2007 by Dana Fleming. All rights reserved.